The steak and salad combo makes this dish a deliciously well-balanced experience of warm and cool, crispy and soft, tangy and rich. It can easily be a great gluten-free lunch or dinner. 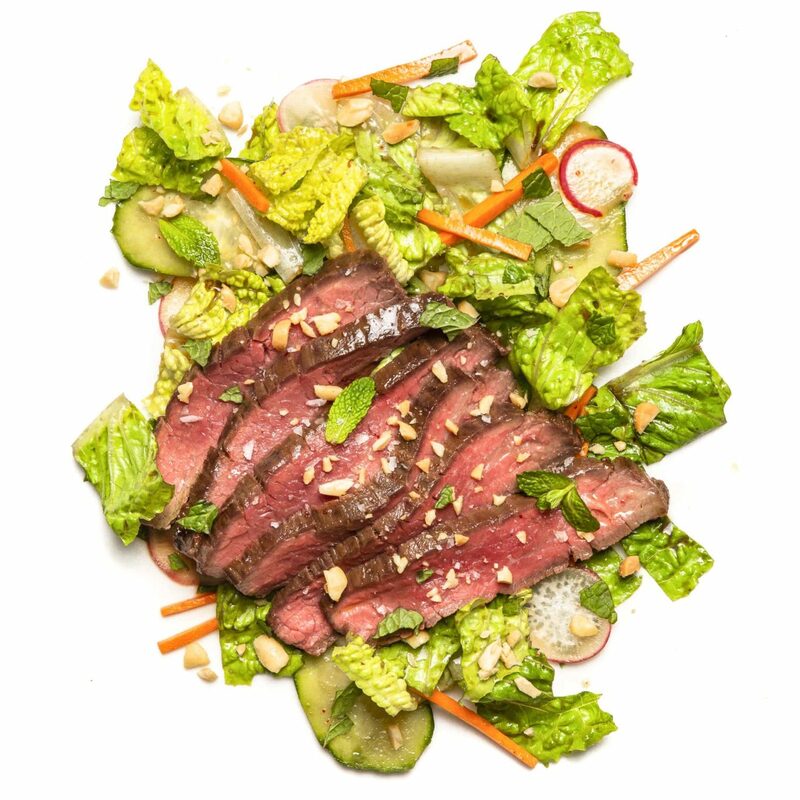 This delicious gluten-free salad has the trademark dynamic texture and tangy-savory taste of Vietnamese dishes, plus plenty of greens and steak to fill tummies. Note: you need to marinate for 30 minutes so plan accordingly. Make the dressing: In a medium bowl whisk together the soy, chili sauce, lime juice, fish sauce, sesame oil and brown sugar. Place the flank steak on a small, rimmed plate. Spoon 1-1/2 tablespoons of the dressing over the flak steak to coat, then let it marinate at room temperature for 30 minutes. Set the remaining dressing aside. Meanwhile, in a large bowl, combine the lettuce, cucumber, radish and carrot. Position an oven rack 5 to 6 inches from the broiler, then heat the broiler. Line a small rimmed baking sheet with foil. Heat the prepared baking sheet in the oven until hot, 5 minutes. Carefully remove the sheet from the oven, put the steak on the sheet, and broil, without turning, until the meat is browned and somewhat firm, with some give when pressed in the thickest part, 5 to 7 minutes for medium-rare, or longer for more well done. Let rest for 10 minutes. Slice the steak thinly against the grain, about ¼ inch thick. Season generously with salt and pepper. Drizzle the remaining dressing over the lettuce mix, then toss gently to coat. Divide the salad between two plates. Add half of the steak to each plate, garnish with peanuts and herbs, and serve.